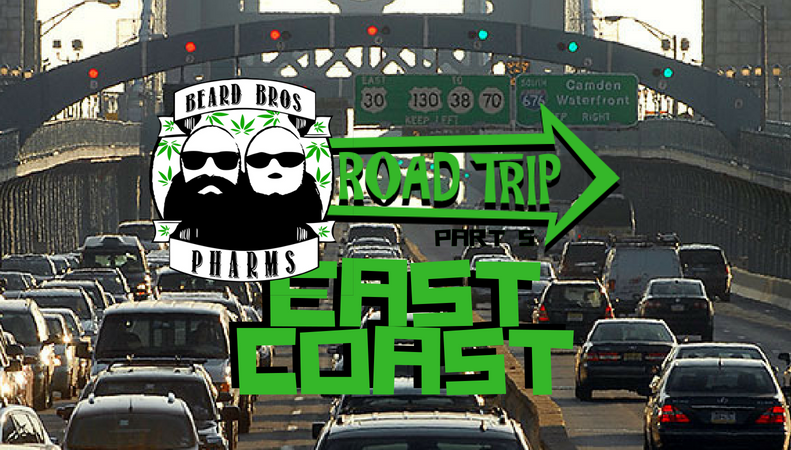 We’re on the home stretch of the Beard Bros. Pharms 50 State Cannabis Laws Road Trip now, buds! You’ve got the grinder and we've got the wheel as we sesh our way up the seaboard and toke our way up the turnpike to see what’s good on the eastern front of the war for cannabis legalization. Our own journey began out here so it’s good to check in and see just how far things have come on the Beast Coast. Get in, we’re doin’ weed stuff! As a swing state politically, Virginians in the northern part of the state and those in the south have a hard time rallying around any one common issue, except when it comes to cannabis. Nearly 80% of the state’s residents support decriminalizing weed and replacing possible jail time with a slap on the wrist or a minimal fine if they are caught with a personal amount. 62% of those polled favor full recreational legalization of marijuana in the state. What they do have is a medical marijuana program that began as a very restrictive CBD-only law that was reserved only for those suffering from intractable epilepsy. Last year that MMJ law was expanded and now Virginia docs can prescribe CBD and THC-A oils for almost any condition. The problem is, all of that oil has to come from one of just five state-run labs that will process and distribute it and those are not expected to open until this time in 2019, or later. In the meantime, anyone busted with any amount of cannabis under ½ ounce is subject to a $500 fine and 30 days in jail – even for your first offense. If it’s a subsequent offense, the fine jumps to $2,500 and the jail time up to a year, again for any amount of weed. Any sale or cultivation or trafficking of cannabis over ½ ounce is a felony crime in Virginia with mandatory minimum sentences ranging from 1 – 40 years! Possession of ANY hash or hash oil outside of the half-established MMJ program is a felony that carries a 1-10 year term. If you sell ANY of it, or bring an ounce or more of it into the state, you could be facing 5-40 years and a felony on your record. Virginia lawmakers have a lot of work to do on cannabis reform but it seems that they aren’t in too big of a rush to do so. Get your boot off our necks already. Finally, they got something right in the nation’s capital, right? As you know, the District of Columbia is not a state, or a city, so it does not have the power to control its own budget – that is handled by the U.S. Congress which is currently thick with morons, sell outs, and reefer-haters. As such, even though the adult recreational use and possession of cannabis is totally legal there, they do not have a regulatory system in place to establish a thriving green economy around the plant. This is a major detriment to the cannabis users who voted for legalization as well as to the local economy which could be raking in record tax revenues. Since there is no place to legally buy or sell weed, the grey and black markets still supply the demand, and this has led to spikes in cannabis-related arrests that rival pre-legalization stats. This is very similar to how their medical marijuana program began, or tried to anyway. It was voted in way back in 1998 but once again Congress refused to fund it and it took years for the first legal MMJ dispensaries to be established. Under the law any adult over the age of 21 is allowed to possess up to two ounces of cannabis and is allowed to grow up to six plants with no more than three of them being ‘mature’ at any one time. They’ve got no love for hash or concentrates, possession of which could potentially put you behind bars for up to 6 months. D.C. is a very cool place to visit, and with weed laws getting more relaxed every time we check, maybe some proper kush will start to lure Congressmen’s’ heads out of their asses. Maryland first passed its medical marijuana laws way back in 2003 but it was not until 2014 that they actually established a regulatory system to open legal MMJ dispensaries and even them it took a few years to get their doors open. Now there are over 50 state-licensed dispensaries up and running and now not just doctors but dentists, podiatrists, nurse midwives, and nurse practitioners can all write recommendations for their patients to receive medical cannabis. Residents of Maryland overwhelmingly support full recreational cannabis legalization but efforts to get the issue onto the voters’ ballots continue to be killed in the legislative process. For now possession of 10 grams of weed or less is, at most, a $100 fine and no threat of imprisonment. But, between 10 grams and 50 pounds (!!!) carries a one year sentence. Penalties for hash or concentrates follow the same guidelines as the flower form. Again, efforts in the state legislature to expand decriminalization of cannabis continue to be shot down by conservative lawmakers. Democrat Ben Jealous is running for state Governor in the fall and he fully supports legalizing cannabis for adults 21 and up so if you live in Maryland take a look at the rest of his platform and consider giving him your vote in November. Delaware has a small medical dispensary system with mandatory vertical integration, meaning that dispensaries must grow their own cannabis and can only stock their shelves with those harvests and products. Right now there are three “compassion centers” in operation where registered patients can score their medical marijuana, with a 4th expected to open early next year. Delaware has decriminalized the possession of up to an ounce of cannabis, making it at most a $100 fine. This is an improvement from the way things used to be, but decriminalization only addresses half the problem and still leaves cannabis suppliers on the wrong side of the law. The use of cannabis in public, or in a moving vehicle, remains a criminal offense. At the end of June, the Delaware House of Representatives voted 21-15 to legalize, tax, and regulate marijuana for adults. Great news, right? Well… this is the 3rd time they have voted to legalize cannabis for adults but unfortunately, when it comes to matters of tax law a supermajority vote of 25 is required and they keep coming up just short. Delaware, it sounds like you are close! Continue to push your local lawmakers towards full cannabis legalization. Cannabis reform is happening so fast in New Jersey that this article probably won’t be able to keep up but here’s what’s happening. While Wonka Tour reject Gov. Chris Christie was shutting down beaches and bridges for his own gluttonous gain, Jersey’s MMJ patients suffered for years. When he waddled to Washington to lick Trump’s boots, real action began on cannabis reform in the state. A small but regulated (ie. legal) MMJ dispensary system was formed which has grown to six total stores. Just today, news came down that the program will be doubled this year, with six new applications being made available to what will surely be well over 1000 hopeful applicants. Currently, with only six licensed vertically integrated retailers/cultivators, the state faces a supply shortage and home cultivation is not allowed. As all of that is happening, last week brought news that the State Senate President, the top lawmaker in the legislature, predicts that a bill to legalize the adult use of cannabis will be acted on as early as next month. The man who replaced Chris Christie, Gov. Phil Murphy, ran on a promise to legalize cannabis in the state and it appears that he intends to follow through on it. Until then, penalties for possession and cultivation are still pretty stiff. 50 grams or less of flower could put you in the pokey for up to six months, but if you get caught growing 50 grams or more you dip into a mandatory minimum sentence of anywhere from 3 – 20 years. If they catch you with 5 grams or less of wax or hash, again up to 6 months behind bars and a $1,000 fine. More than 5 grams and you’ll still do the 6 months but that fine jumps to $25,000! Until it is legalized, cannabis users will continue to be discriminated against in New Jersey. Right now it is a misdemeanor just to be “under the influence” of cannabis and just being baked can cost you money, your job, your driving privileges, your housing, and even your freedom. Let’s get it done, Jersey. The medical marijuana program in Connecticut has over 26,000 patients but not one of them is under the age of 18 due to a ridiculous provision to the state’s law that has kept too many kids suffering for too long. But, fortunately, that will come to an end on October 1st when non-smokable forms of cannabis will be made available to kids in need. There are currently 9 dispensaries licensed by the state. Six recreational legalization bills were introduced in the 2018 legislative session and though none will be on the ballot in November, great progress was made and the entire House and Senate are up for re-election in the state this year so there is potential for some real change on the issue of recreational cannabis legalization. Since 2011, possession of up to a half ounce of cannabis has been a non-jailable offense that carries, at worst, a $150 fine. They treat hash, wax, and dabs the same way. If you are under 21 though, you could have your driver’s license suspended for up to 60 days – so beware of that. We’re willing to bet that Connecticut goes totally legal in 2019. In May, Rhode Island state Sen. Josh Miller introduced legislation to legalize, regulate, and tax marijuana for adult use. The Senate Judiciary Committee, however, has decided to put it on the shelf until at least February of 2019 despite the fact that 60% of residents want it legalized. On the medical side, Gov. Gina Raimondo attempted to make a number of changes to Rhode Island’s MMJ program, including expanding the number of “compassion centers” from 3 to 15. Leaders in the state’s Congress not only rejected those proposals, but then proceeded to raise the annual dispensary licensing fee from $5,000 to a whopping $250,000 – the highest in the country. One bright spot from the most recent legislative sesh was the passage of a new bill that will allow Rhode Islanders to retroactively expunge criminal offenses from their record for violations which have been subsequently decriminalized, including marijuana possession. That’s a big deal and needs to happen everywhere. For now possession of an ounce or less is a non-jailable offense with a max fine of $150. But, like with most decriminalization laws, growing and/or selling weed is still dangerous. Any cultivation or distribution under a kilo is a felony with a potential 30 year term. Hopefully the pressure from neighboring states going green will be enough to flip Rhode Island to the dank side in 2019. In November of 2016 Massachusetts voters overwhelmingly ended marijuana prohibition for adults 21 and older. Retail sales of cannabis to anyone over the age of 21 were expected to begin this summer, but the licensing process has been bogged down by bureaucracy and so far only five licenses have been issued to two companies, with dozens more in limbo. In the meantime, if you know where to get some, anyone over the age of 21 can possess up to one ounce on the streets and up to 10 ounces at home without threat of penalty. Those aged 18 to 20 pay a civil fine but do no jail time, and minors found with weed are made to take a drug education course. For those over the age of 21, possession of up to 5 grams of hash or extracts is totally legal, and between 5 grams and a full ounce is just a $100 fine if the cop is feeling frisky. Oh, and yeah, you can grow your own – up to six plants. The state’s medical marijuana program also continues to thrive and expand under the umbrella of full legalization. How do we like dem apples? Well, as a matter of fact, we do like dem apples. Keep it up, Mass-holes – we love ya! In a tight race that prompted a disgruntled recount by the losers, cannabis advocates passed adult use cannabis legalization in November of 2016 but, as in many of these early adopters, the state has yet to open any actual retail outlets. In fact, they probably will not open until this time next year. The process was delayed by the cranky old Gov. LePage who originally vetoed the bill but had his pen neutered by the state legislature who went around him reinstalled the law. LePage tried the same thing this year with the state’s 20-year-old medical marijuana program. Bills were advanced to improve the program and the Governor vetoed them all, but again, he was overridden and the program was allowed to expand. Now there is no more list of qualifying conditions – if the doc says you need weed, we don’t need details. The new laws will also expand the current network of state-licensed dispensaries from 8 up to 10 and will eliminate that cap altogether by the end of 2021. For now, if you are 21+ but you are not an MMJ patient in the state, you can possess, gift, or trade up to 2.5 ounces of cannabis legally and you can grow up to 3 mature cannabis plants of your own. Hey, Maine, whatta ya know… Governor LePage is up for re-election this year – let him know what you think, eh? All three of New Hampshire’s neighboring states have now made marijuana legal for adults 21 and older and four consecutive polls published by the University of New Hampshire revealed that at least 60% of New Hampshire voters support legalizing cannabis for adult recreational use. Still, Gov. Chris Sununu cannot get behind the movement, though he has supported recent decriminalization efforts when it comes to cannabis. There will be no vote on the issue on this November’s ballot. In New Hampshire, you can possess up to ¾ of an ounce of cannabis flowers before facing anything other than a civil monetary fine. But if you’re caught growing it, that’s a felony and 3+ years in jail. THAT is how decriminalization works, friends… (it doesn’t). The state’s medical marijuana program has over 4,700 registered patients and they are allowed to possess up to 2 ounces of weed but cannot grow their own. We are going to pass on through until they figure it out up here in the Granite State. As of July 1st of this year, adults ages 21+ in Vermont are allowed to have up to one ounce of marijuana and can grow up to two mature marijuana plants and four immature marijuana plants without fear of legal repercussion. Though it is a bit more limited than some other state laws, all eight of the other states legalized marijuana by ballot initiative, this is the first time any state legislature has ended marijuana prohibition through the legislative process rather than by a vote of the people. It’s a big deal because it shows that pressure on lawmakers can force them to bend to the will of the people. Again, state-sanctioned recreational cannabis outlets have yet to be established and illegal sales still carry harsh penalties – 2 years and $10k for a ½ ounce or less… felony charges, 5-30 behind bars and up to a $1,000,000 fine once you start moving real weight. The state’s MMJ program enjoys sustained and planned growth as it closes in on 7,000 registered patients who are now served by a half a dozen licensed dispensaries. A recent poll by Emerson College showed that 62% of New York residents favored legalizing, regulating, and taxing the recreational use of cannabis for adults and it seems that state lawmakers are finally starting to pay attention. On July 13, the state Health Department issued a report recommending legalization of the drug, and Gov. Andrew Cuomo suggested that it was “not a question of if, but when” legalization would happen in New York. After over 18,000 people were arrested in New York City alone in 2016, Mayor Bill DeBlasio announced in June of this year that the city would hand out tickets for low-level cannabis possession instead of arresting folks for it. These are all steps in the right direction, but they are baby steps and it is time for the City That Never Sleeps and the rest of the Empire State to wake up when it comes to real cannabis reform. The state’s medical marijuana program is a joke. It relies on primitive lists of ‘qualifying conditions’ and it bans edibles as well as smokable cannabis. Ahh… Pennsylvania… where it all started for Beard Bros. Pharms even before we had beards! The danger associated with cultivating or even just consuming cannabis back east in those days was enough to encourage our westward migration but we are stoked to see that our home state is finally coming around on cannabis reform. Pennsylvania legalized the medical use of cannabis in 2016 with a bill that would allow the licensing of up to 25 marijuana growers and processors and up to 50 dispensaries. It took 2 full years of regulatory wrangling, but in February of this year, the first MMJ dispensary sales began. There are currently 27 shops open serving well over 30,000 registered patients, with plans for over 80 retail outlets once all is said and done. The laws originally did not allow cannabis to be smoked, only used as a pill, oil, topical gels, creams, ointments, tincture, liquid or a medically appropriate form administered by vaporization or nebulization. Thankfully, cooler heads prevailed and that was revised so flowers are back on the menu. Once fully established, Pennsylvania is predicted to have one of the largest and most lucrative medical cannabis markets in the nation, but the real experts have their eyes on recreational cannabis where they say the state could rake in a massive windfall of $581,000,000 every year if it regulated and taxed the plant like they do with booze. For now, you still don’t want to get caught holding if you are not a local MMJ patient. Possession of 30 grams of buds or less is a potential misdemeanor and 30 days locked up. Over an ounce and you could be looking at a year behind bars. Sales of under an ounce, again potentially 30 days, but over an ounce and you’re looking at a felony and up to 5 years. Any home cultivation – medical or otherwise - is a felony with a potential 2.5 – 5 year term and a $15,000 fine. Earlier this year Bethlehem became the latest city in Pennsylvania to decriminalize low-level possession of cannabis, joining Philly, Pittsburgh, Harrisburg, York, State College, and Erie. Law enforcement, however, can always defer to state law because decriminalization is never the answer. We have family and friends all over the map in PA and we’d love to see our brand back in our home state again soon – would you? Keep fighting for full cannabis legalization – we’ve got your back! 50 states in 5 weeks! Every state has its own history and culture and traditions, and there are just about as many forms of cannabis “legalization” to go along with them. The overriding lesson is that we truly need this movement to reach the federal level so that we can avoid trying to appease every crooked, corrupt, backwards, backwoods, city council jerkoff or state representative who has never taken a toke in their godforsaken life. It’s time for THC and CBD and the rest of the plant to be descheduled – removed completely from the Controlled Substances Act – so that it can be studied, sold, and enjoyed freely by a society whose demand for that outcome grows by the day. We try to do our part by distributing the dankest news to you and by producing the finest cannabis and cannabis-related products we can and putting them out into the world as well.